Did I mention I love Quattro? On a rain-slicked night in Italy’s soaring Dolomites, that romantic attachment to Audi’s once-groundbreaking, damn-the-weather traction system is easy to understand. 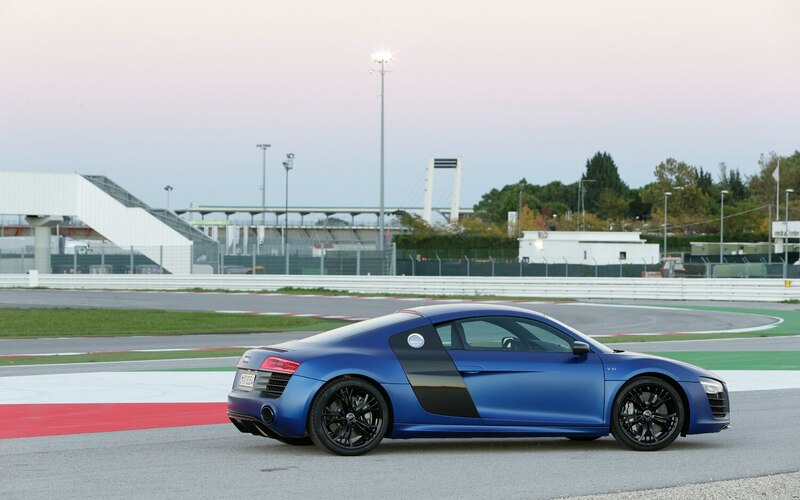 We’re driving the discreetly revamped R8 on a two-day northbound trek from a Moto GP track in Rimini, to a memorable seaside lunch in Venice and into the mountains of Italy and Austria, descending to take a beer-soaked checkered flag in Munich. 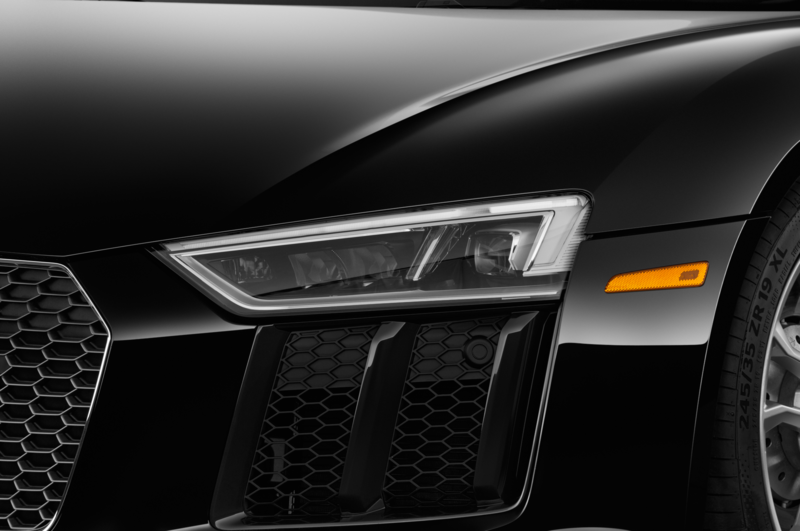 But you don’t have to be living la dolce vita to appreciate the oft-downplayed performance edge of Quattro. 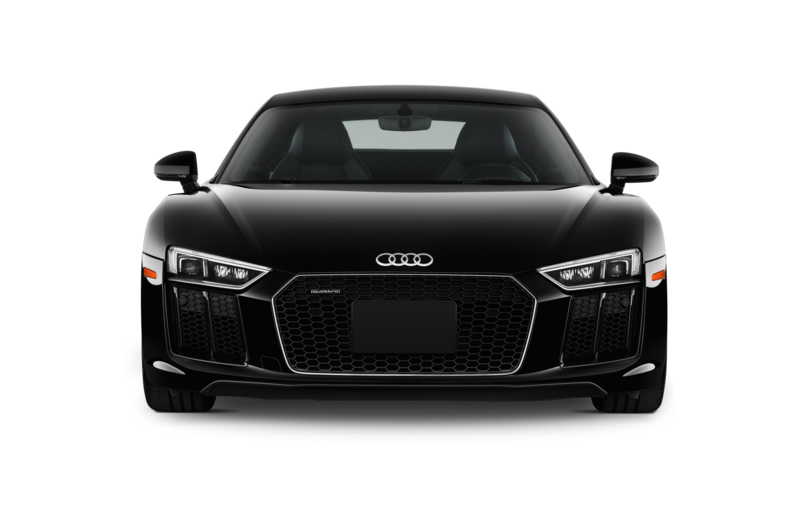 On a slippery morning in Toledo, or a downpour in Sonoma, Audi sports cars go all superhero while the weather Kryptonites rear-drivers like Corvettes, sapping their vaunted muscle, turning them into timid Clark Kents. A nice set of winter tires helps. With autumn snow already frosting high Alpine passes, an Audi engineer has prudently shod our R8 convoy of V-8 coupes, V-10 Spyders, and the V-10 Plus model with Dunlop Winter Sport tires. 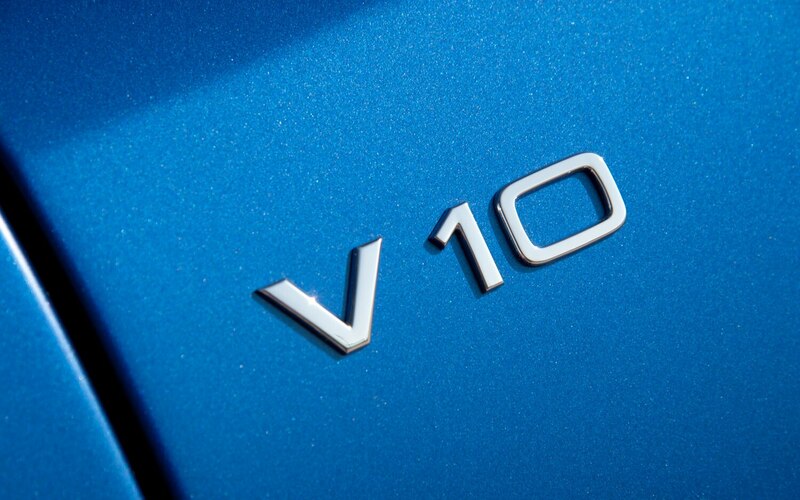 That V-10 Plus model is new. 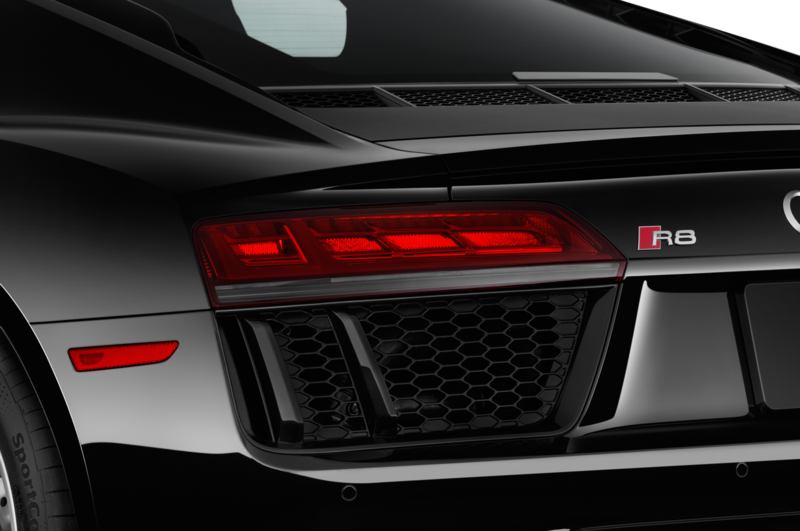 This weight-watching, 550-hp show-off replaces the limited-run GT coupe and Spyder atop the lineup when R8s reach showrooms in March. (These time-travelers skip past 2013 for a 2014 model-year designation). 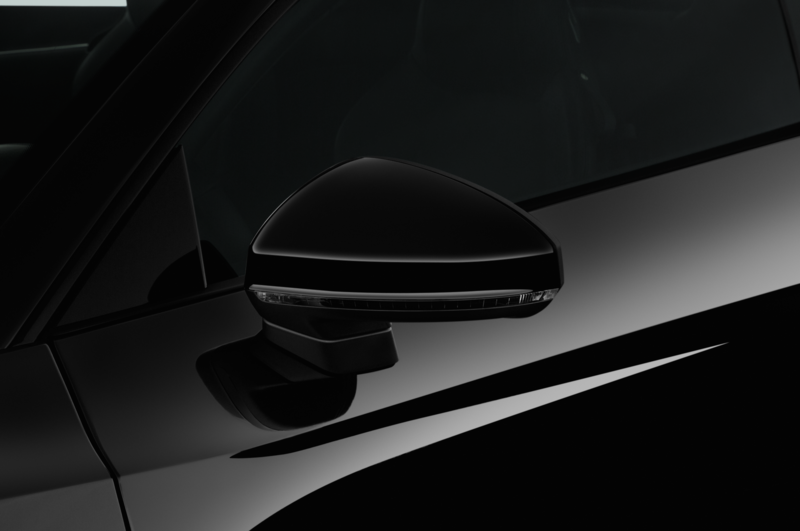 For now, the Plus is available only as a hardtop. 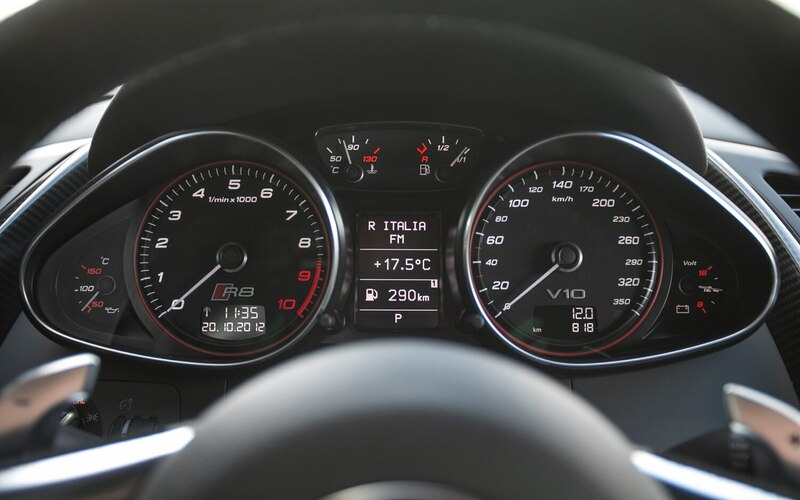 The Euro-market Plus we’re driving shaves 110 pounds from the standard V-10, in part via ceramic brakes and less sound-absorption material. American versions will weigh more, forgoing the Euro version’s fiberglass shell seats and clear carbon engine cover. Here, with the moon poking a hole in stubborn clouds, I’m climbing a 525-hp V-10 Spyder through northern Italy’s Parco Nazionale Dolomiti Bellunesi. This national park’s spectacular, pink-hued granite walls and strange grassy peaks stand between me and Bolzano — or Bozen, the town’s Deutsche name in this largely German-speaking province of South Tyrol. 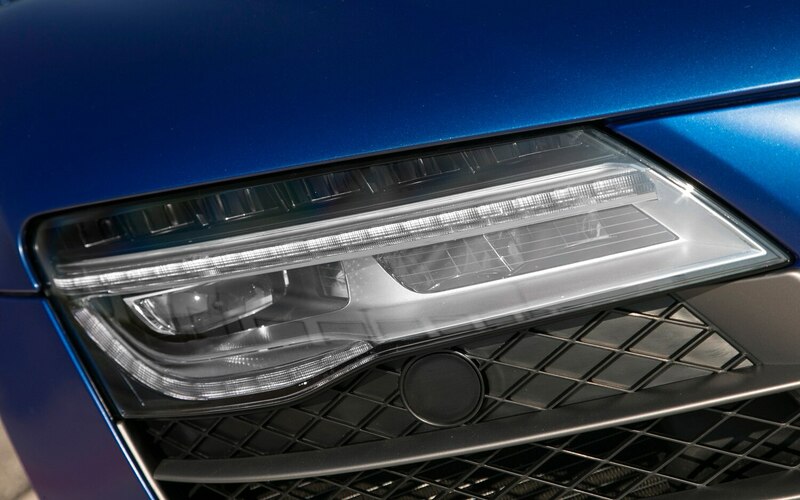 But at this moment, I can’t see much beyond the Audi’s reworked LED headlamps, one of several modest styling changes that require a sharp eye or a micrometer to notice. 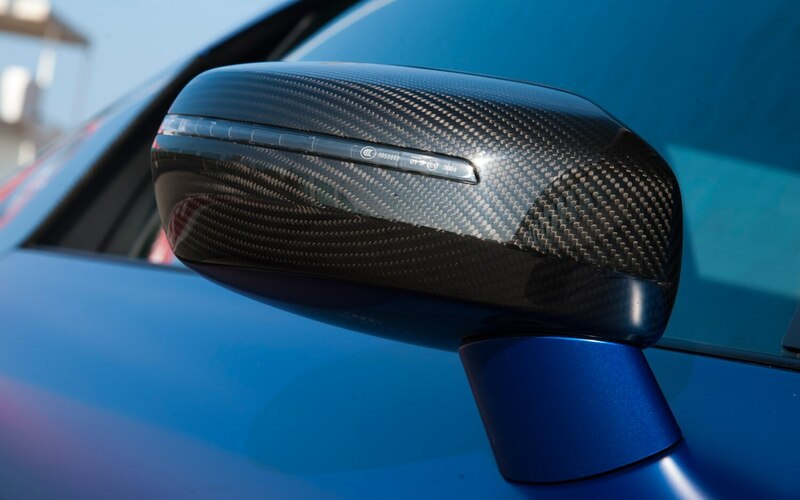 Front and rear bumpers are new, as is a carbon-fiber front lip splitter, standard on the Plus. 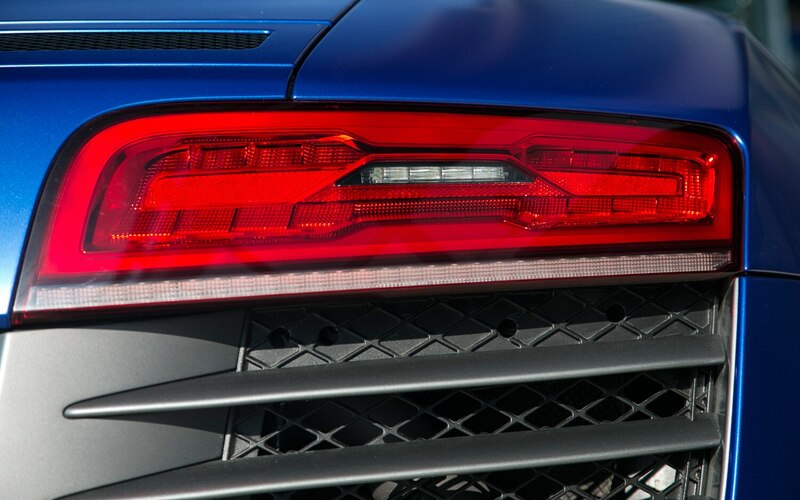 New dynamic rear turn signals put on an animated show, pointing a strip of light in the direction of the turn via 30 LEDs that fire in sequence every 150 milliseconds. On the home stretch of the opening day’s run from Rimini to Bolzano, I’m impatiently gunning the mellow-throated V-10 that takes center stage in the Audi’s aluminum space frame; pushing the R8 through switchback climbs and near-bottomless descents, perhaps a touch fast considering the slick road and snowbound banks flashing their familiar slow-it-down warnings. It’s almost a good thing — almost — that I can’t see the sickening plummets looming in the dark, as the ragtop R8 carves through a gauntlet of 10-foot-tall reflector poles that turn this road into a surreal nighttime slalom course. But again, what the hell: It’s Quattro, baby, and it’s bellissimo. 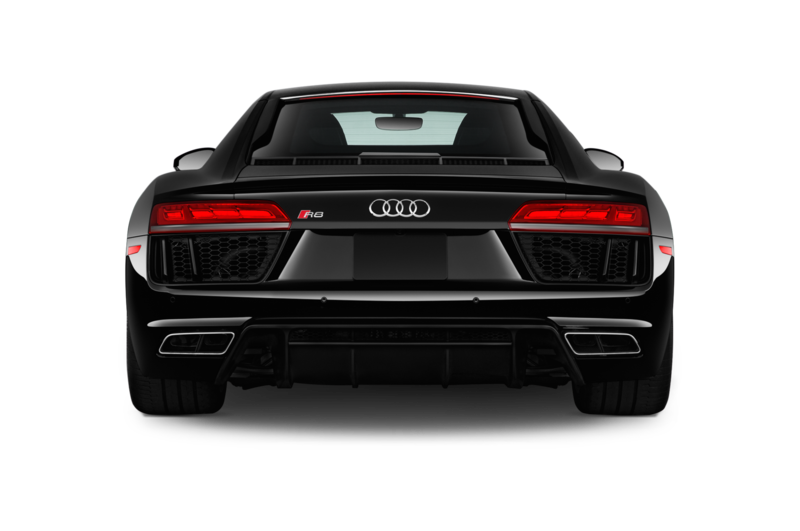 “Beautiful” also aptly describes the R8’s most sorely needed upgrade: The seven-speed, paddle-spanking, dual-clutch S tronic automatic transmission. Already happily whisking through gears in the Audi S4, S5 and RS5, the S tronic (finally) buffs an Audi halo car that had been tarnished by the balky one-clutch R-Tronic. 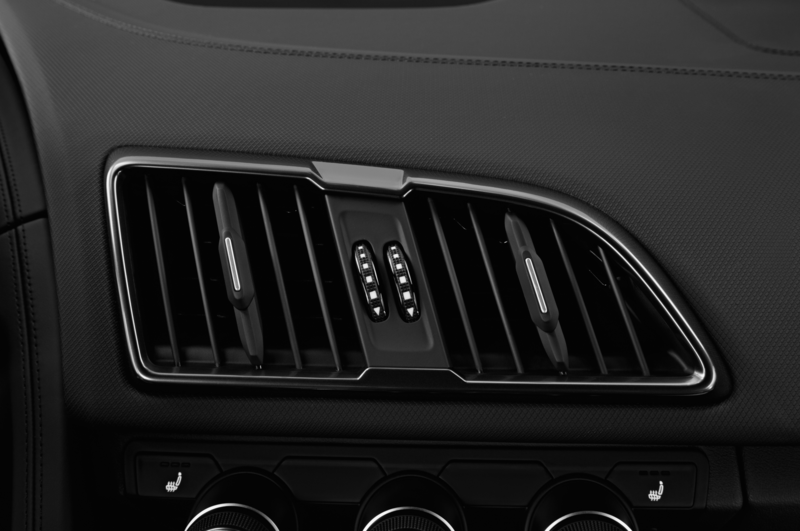 Just 23.6 inches long, the S tronic nestles low and aft of the hand-built Hungarian engines: The familiar, 430-hp 4.2-liter V-8 and 525-horse, 5.2-liter V-10. 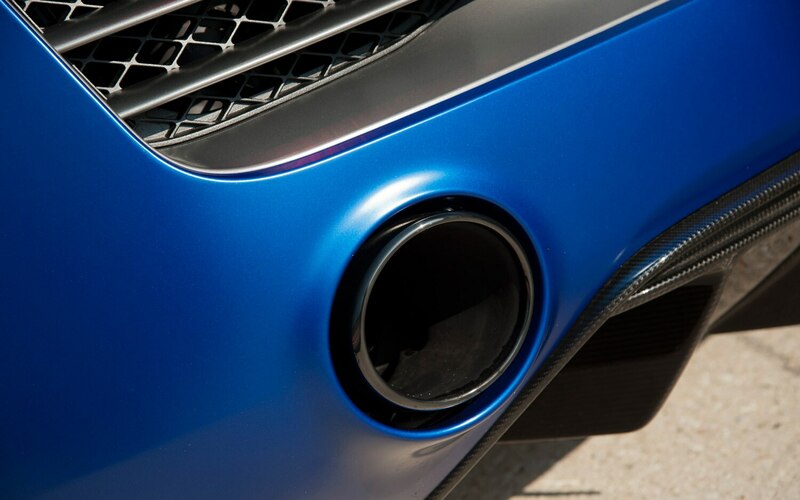 A recalibrated engine and freer exhaust lend the Plus its 550 hp. All by its lonesome, S tronic chops 0.3 seconds from every automatic model’s 0-60 mph time, one sign of how arthritic the old transmission was. 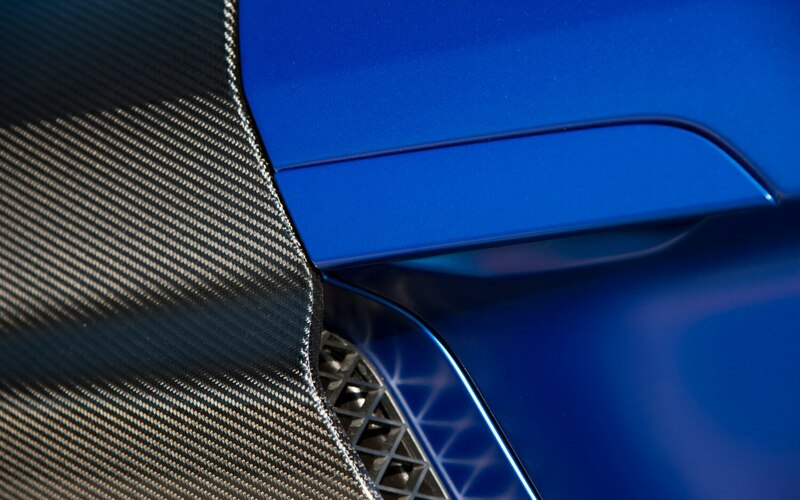 The Plus especially spins the needle like a self-respecting supercar, at 3.5 seconds to 60 mph and a 197-mph terminus. 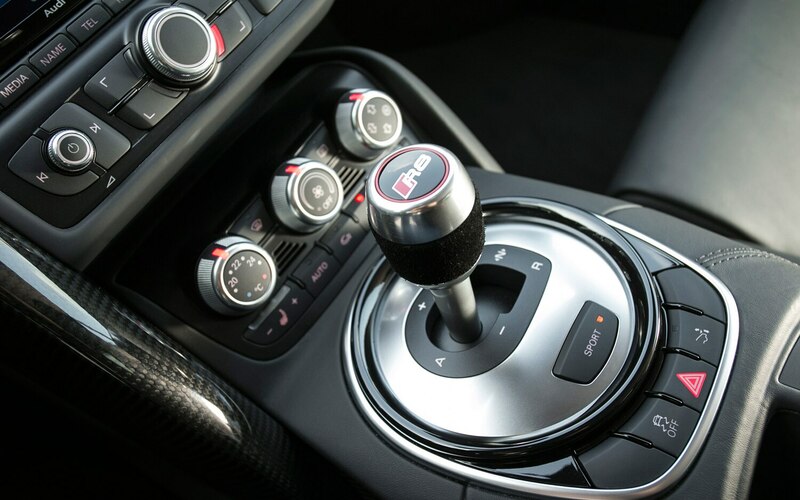 Hard-core buyers won’t be dissuaded from the terrific, metal-gated 6-speed manual, even if it takes a human-scale bite out of acceleration. 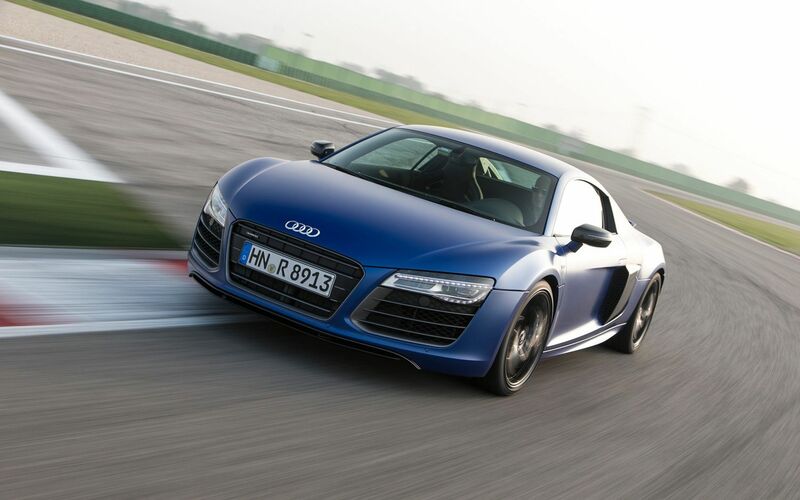 (The “slowest” R8 is the manual 4.2 coupe, at 4.6 seconds from stoplight to 60). But the S tronic is one brilliantly versatile box, silky when you want it, but ever ready to blip the throttle, hook up four fat tires, and fly through gears like a Vegas sharpie flipping aces. 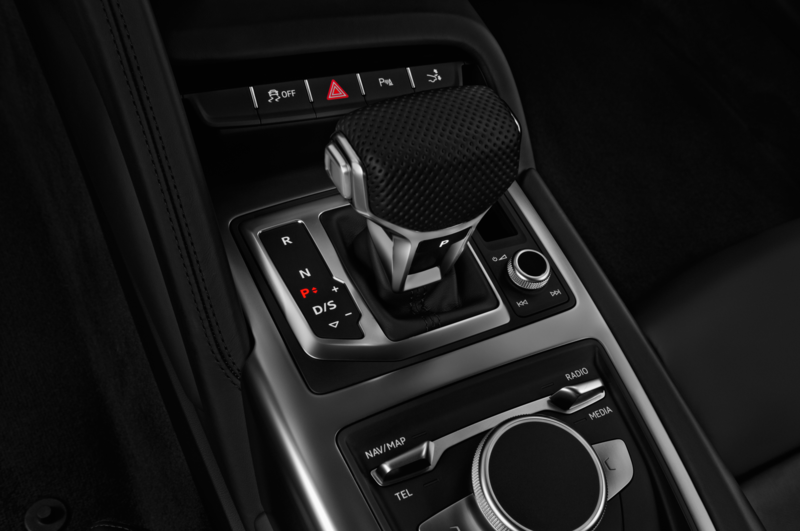 Unlike its often-abbreviated gearbox rivals, including the Porsche PDK and BMW DCT units, the Audi transmission has no driver-selectable range of shift force, from cushy to spine-crushing. 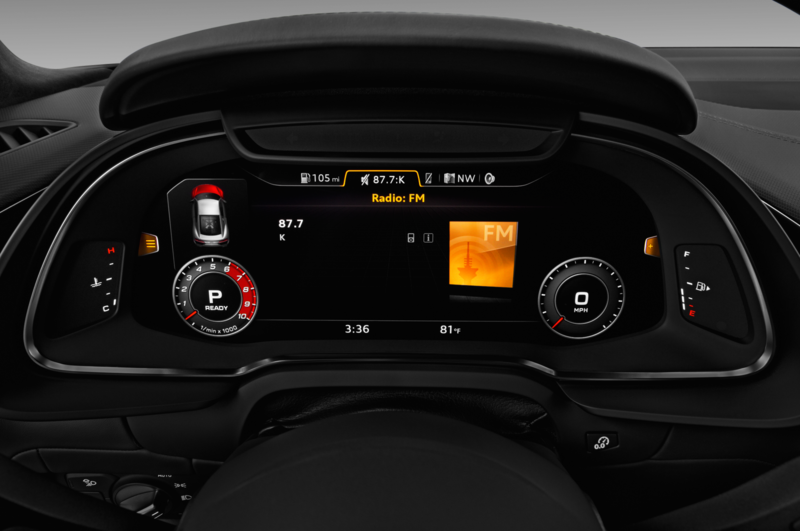 Yet the Audi’s agreeable philosophy suggests that, if a transmission is perfectly tuned, who needs extra buttons to make it work? 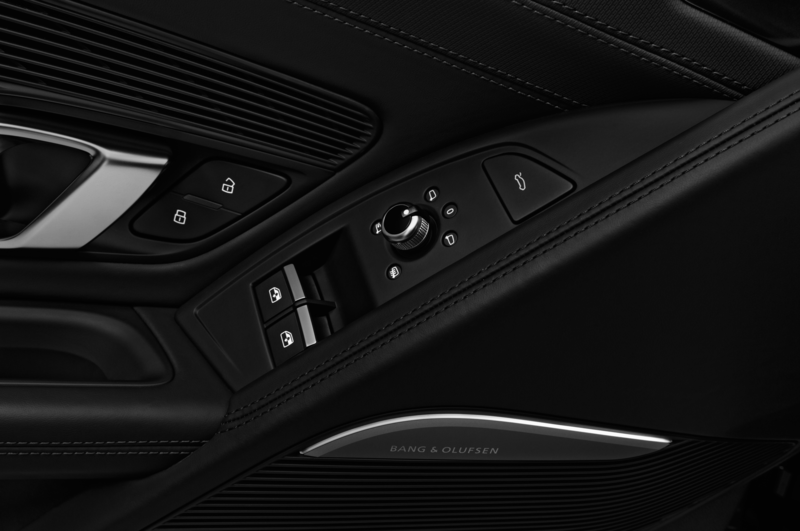 A console sport button does raise shift points and goose the throttle. 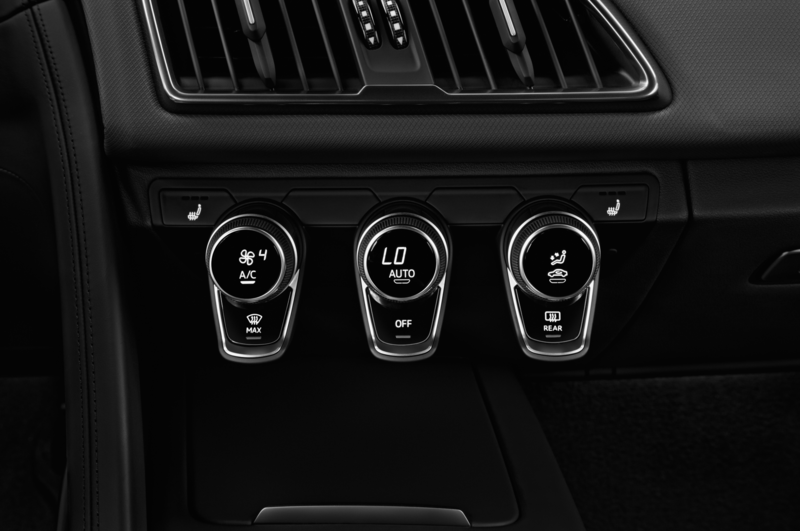 That’s flanked by a switch that subtly firms up the adaptive magnetic suspension, standard on V-10 editions. 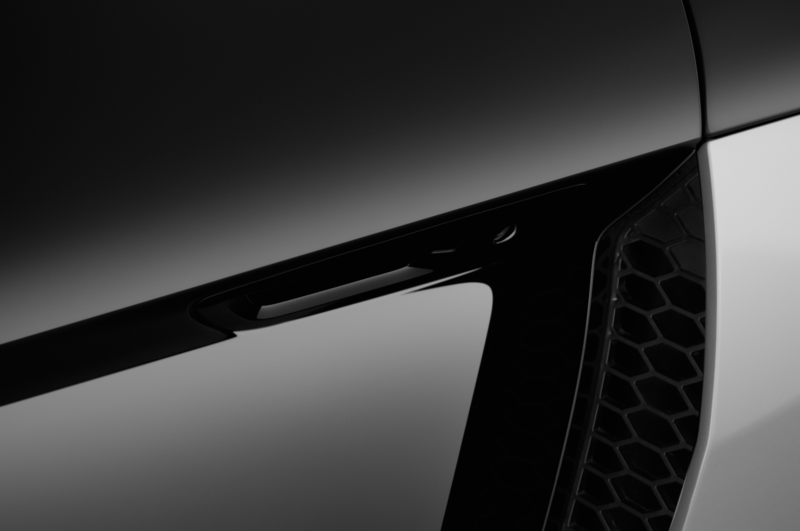 As for stiffness, the Plus splits the difference between less-powerful models and today’s sinewy GT. 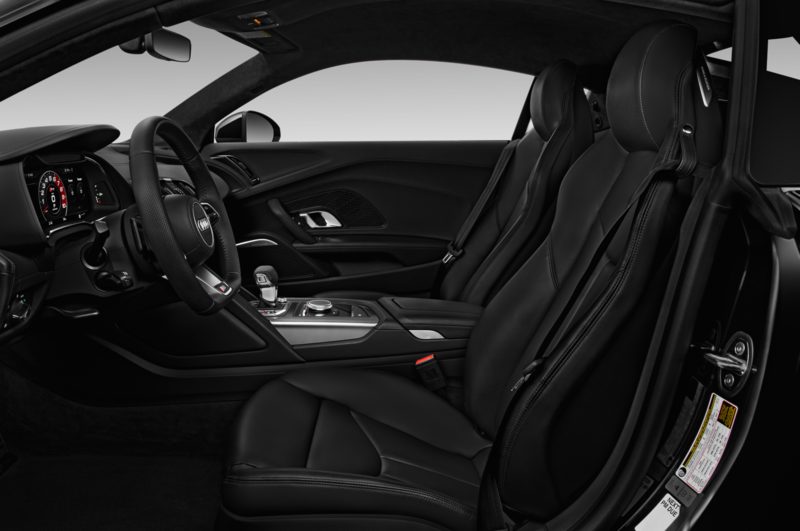 The R8’s cabin has steadily improved since its rather monochrome 2007 debut. 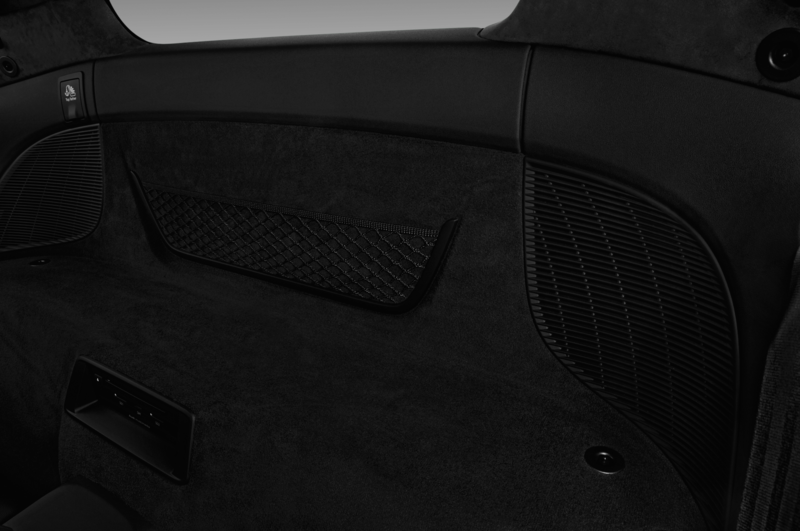 A wider selection of optional trims includes a gorgeous, Bentley-esque leather package that wraps seats and doors — and headliner for the Plus — in honeycomb-quilted leather. 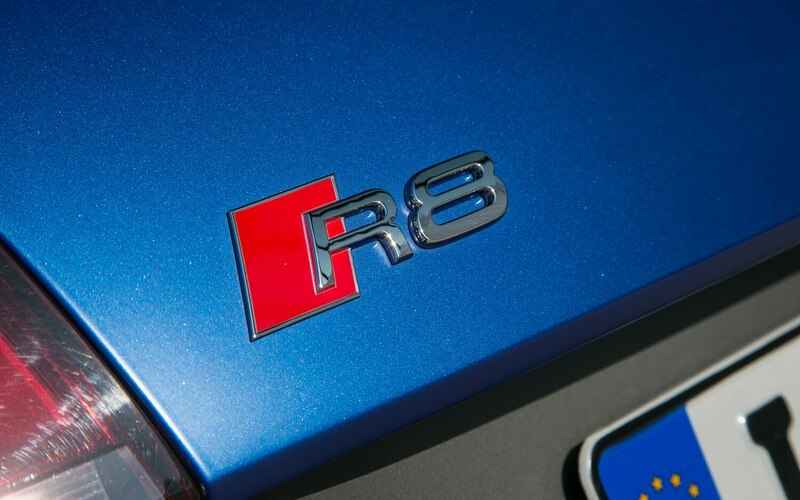 The S tronic transmission solves the R8’s Achilles heel, but may leave a sour taste in some mouths: Opting for S tronic should add about $9,000 to the sticker. Whoa. That’s nearly three times the price of Porsche’s equally stellar PDK. One or two jaded journos suggested that, if Audi can successfully charge nine grand for a transmission, then the buyers who ante up are the only dupes. Sorry, but I don’t see it that way. That automated money grab seems unjustified, whether or not you feel sympathy for buyers of means, or people — and they’re the majority these days — who just prefer a modern automatic. 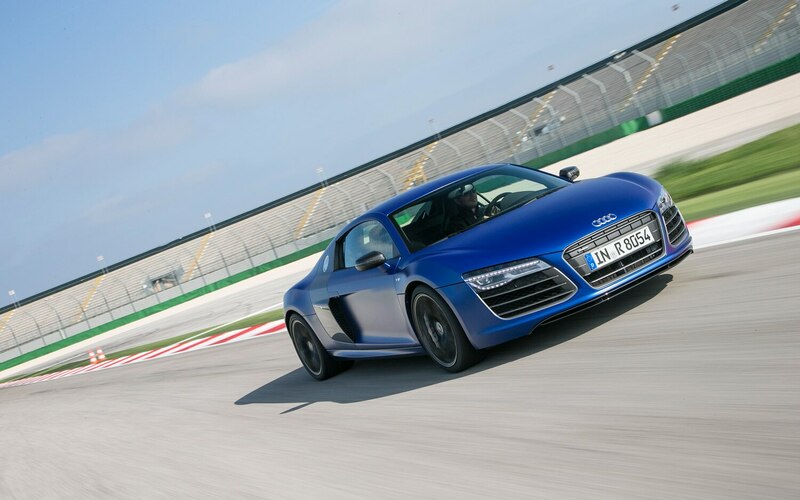 Fortunately, Audi doesn’t make us plebes fork over a check to lap the R8 at Misano World Circuit, the starting point for our adventure. 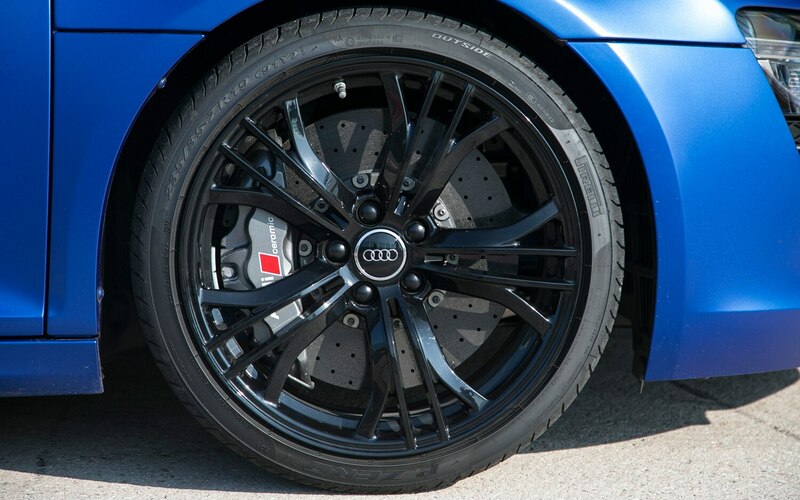 The day includes wicked laps in the R8 LMS ultra racer that won May’s 24 Hours of Nurbuergring. 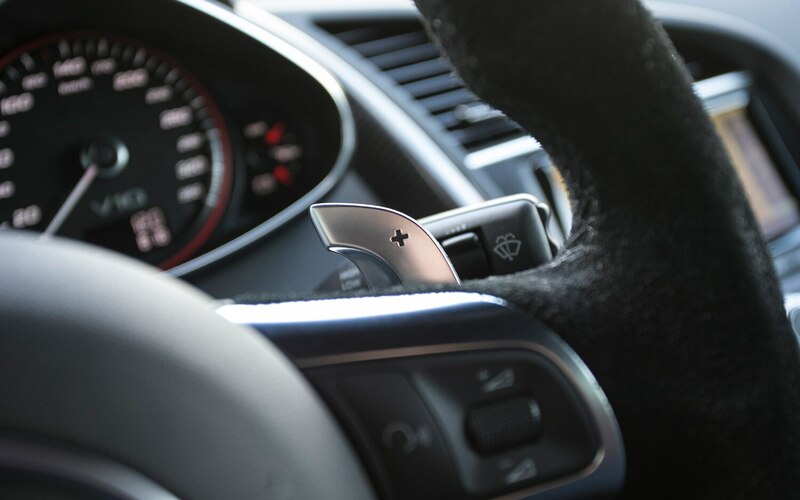 I ride shotgun with Audi pilot Frank Stippler, who drives more like naughty Stifler, slicing past pit-exit guardrails at speeds that have me sucking in my breath. 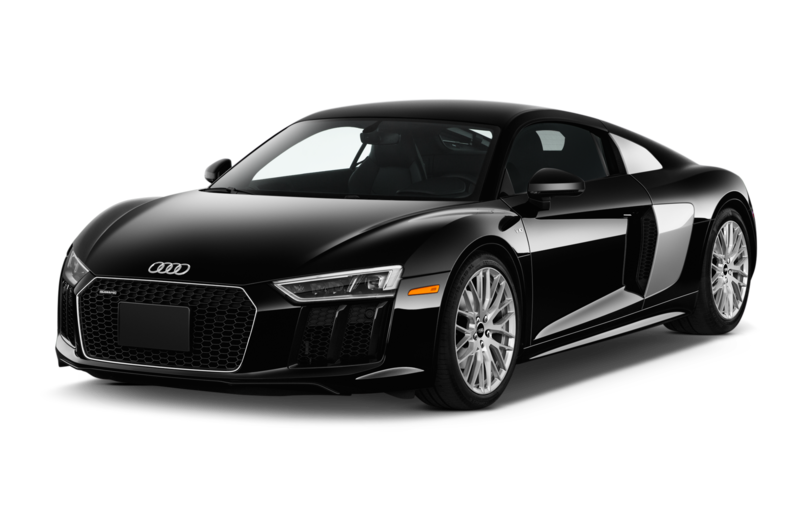 The takeaway, aside from pure jollies, is that Quattro GmbH, and its 780 employees in Audi’s performance subsidiary, designs and builds both race and street R8s in Neckarsulm, Germany. 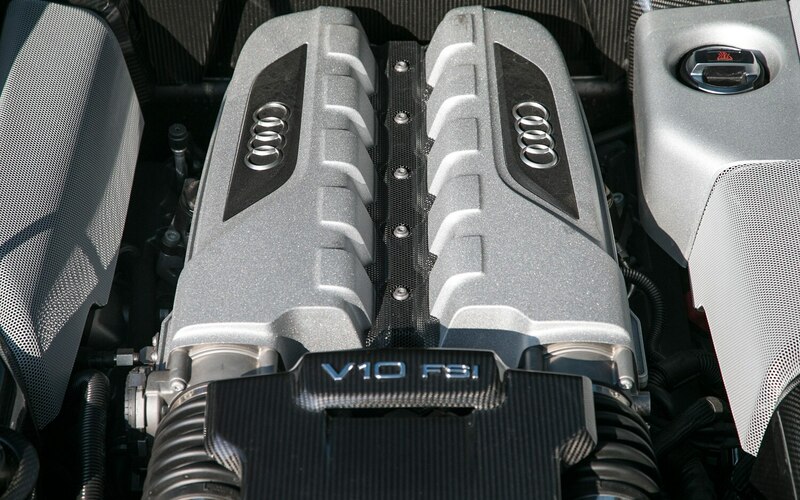 Audi swears on a Gutenberg stack that the rear-drive LMS triumphs with a production-based R8 V-10 engine. Moreover, that engine has required rebuilding only every 20,000 kilometers, unheard of durability at this level of racing. Misano’s asphalt is as greasy as Sal Mineo, and the Audi — dressed in summer rubber for the day’s action — runs out of traction a tad sooner than expected. 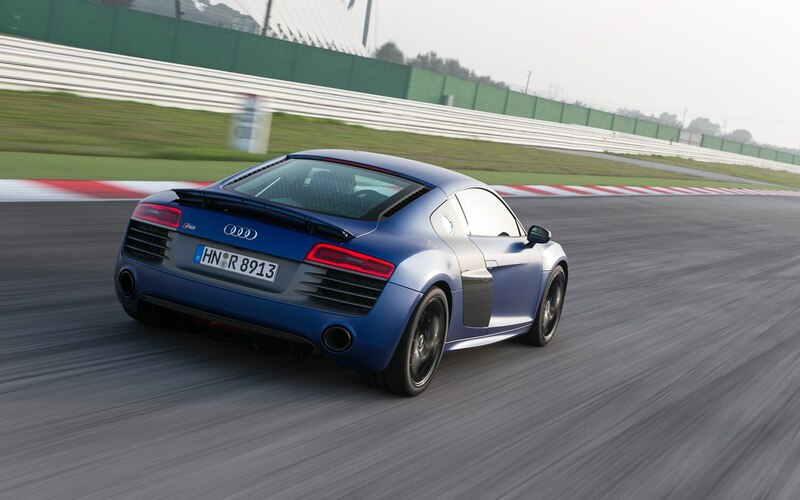 The R8s can certainly rock a stopwatch on track, and both engines are wonderfully flexible. 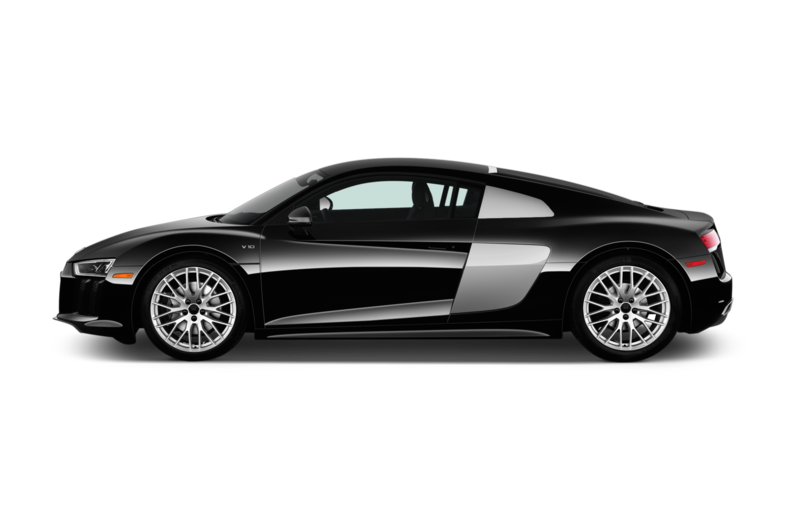 But despite the midship layout and rear-biased weight distribution, the R8 is committed to benign understeer, determined to keep its owner out of the emergency room. 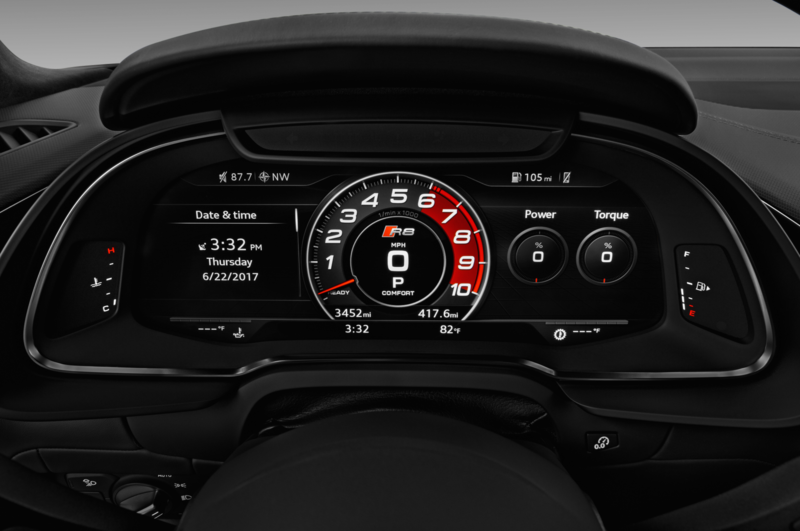 Steering is robustly weighted and accurate, but its overall feel won’t have anyone trading a Ferrari or Porsche 911 GT3. 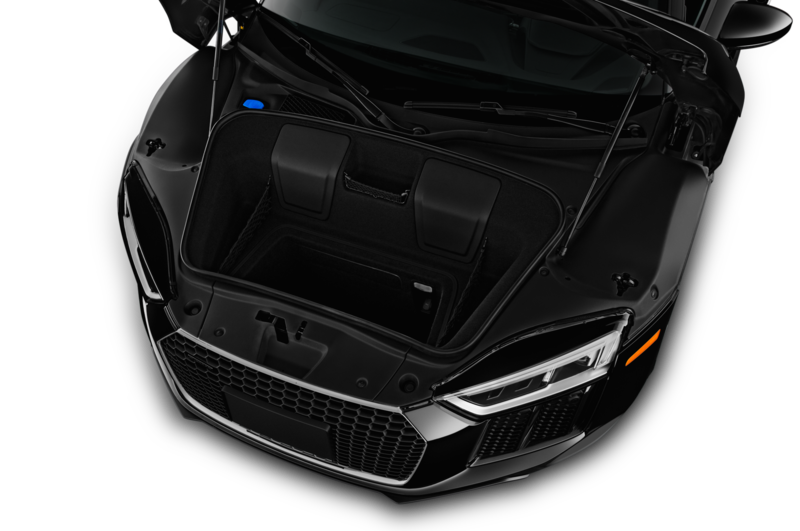 Unlike some top-shelf sports cars, the R8 doesn’t feel anxious in traffic, punish your vertebrae on long trips, or frustrate you with archaic, confusing switchgear. 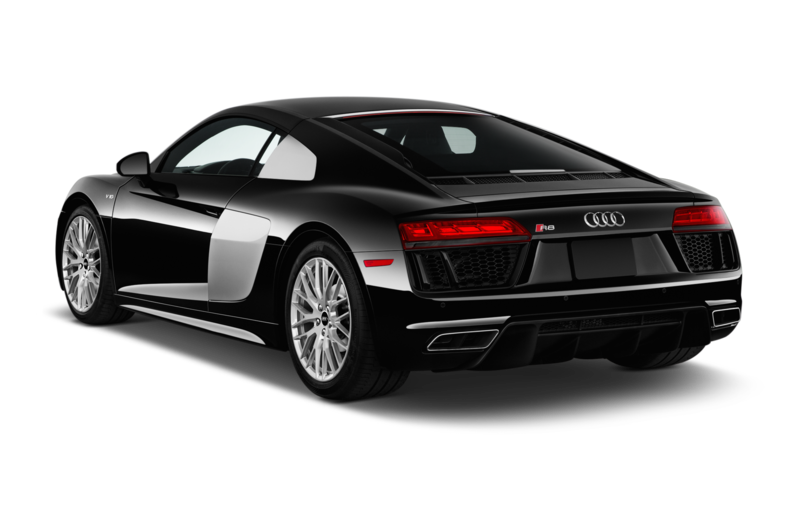 It’s hard to generalize about low-volume sports cars, yet some owners affirm that their R8 has been more reliable and less costly to service than other exotics. 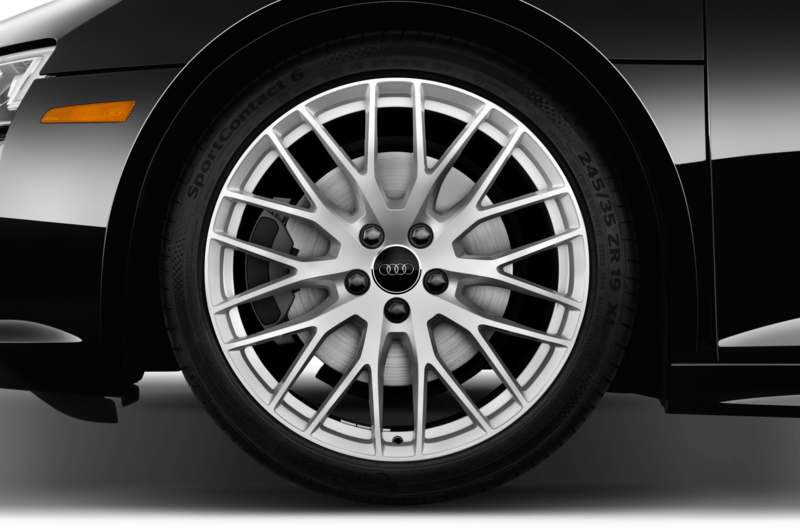 Certainly, Audi dealerships are easier to find. Not that anyone will confuse an R8 with a TT. 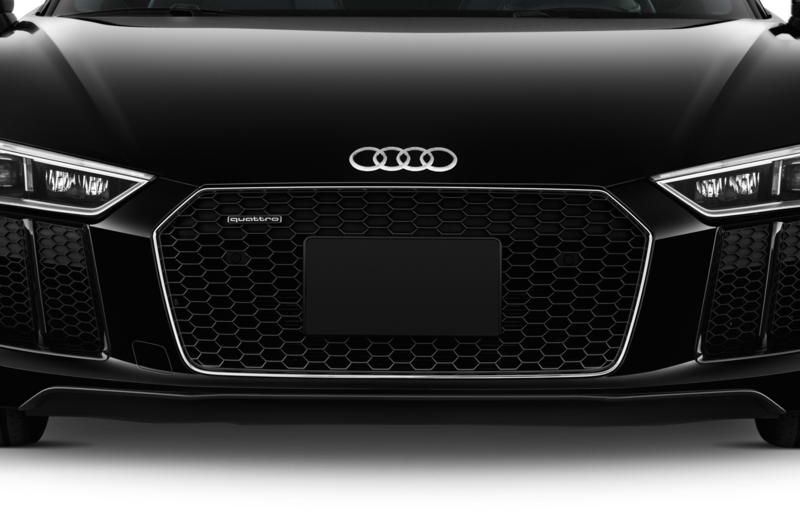 Expect Audi to roughly toe the line on current prices: $115,000 for a 4.2 coupe, $150,000 for a 5.2 coupe, and perhaps $180,000 for the 5.2 Plus, which Audi confirms will undercut the current, $197,450 GT coupe. Sunning in a Spyder should add about $13,500, for either engine. 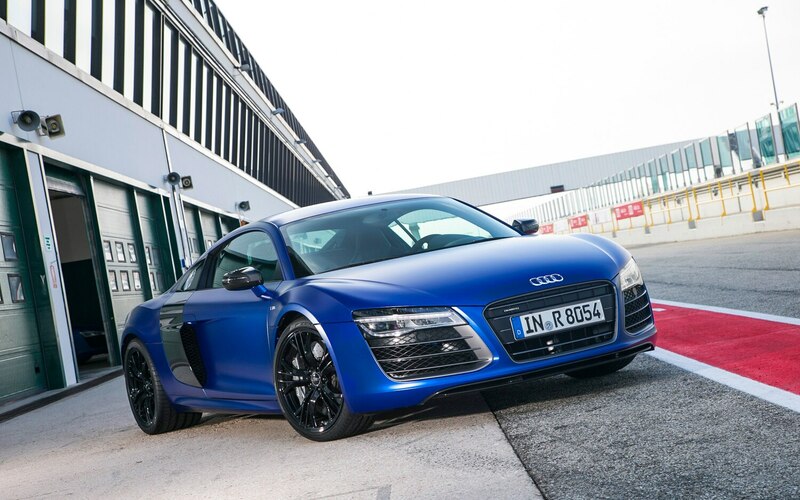 Lucre aside, the Audi’s easy rapport with its driver comes into focus on a final blitz into Munich. 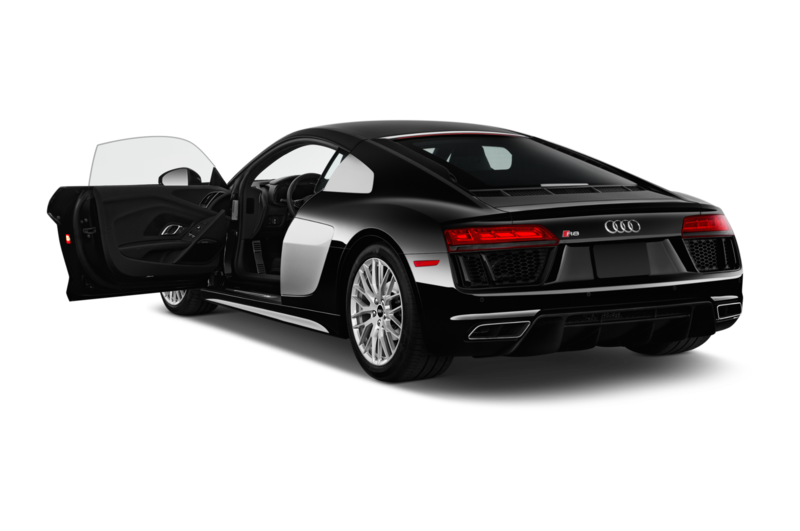 The R8 alternately burns to 150 mph and relaxes in traffic, fresh and comfy after three countries and more than 1,000 kilometers of driving. 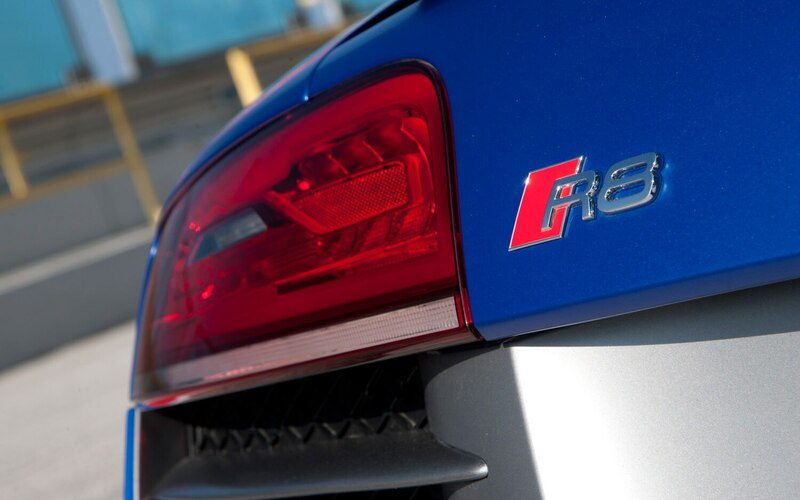 As ever, the R8 appeals to the brain as much as the heart. But sometimes in the sports-car world, brains are in short supply.